First things first, let’s talk turkey… or any other meat that you plan to serve. James Whelan Butchers in Tipperary have a fabulous online shop with a really good range of quality produce such as free-range pork, free-range Hubbard Ross chicken and Angus beef. The ‘Christmas’ section has a great selection of organic and free range Bronze turkey, various hams, goose and even the little extras like cocktail sausages, stuffing, cranberry sauce and goose fat that help make a meal special. They offer nationwide delivery for €10 or free on orders over €100. I have just placed an order for a few things to fill the freezer for the coming month, including those pork bellies! Smoked salmon is synonymous with Christmas and is a gift that is welcome in most homes at any time of the year. The very kind people at Kinvara Smoked Salmon based in Galway recently sent me a lovely ‘Multi Buy’ pack containing their organic smoked salmon, Gravad Lax and fantastic roast smoked salmon. Their award-winning salmon is reared in the wilds of the Atlantic off the west coast of Ireland and would make a fabulous addition to any Christmas menu or an amazing gift. Kinvara Smoked Salmon deliver to 27 countries including Ireland and the UK. A very recent find for me is Little Pod a fairly new small company based in the U.K., specialising in the wonderfully fragrant Madagascan vanilla products. I recently purchased a few items including their Vanilla Gift Collection, which contains a handy 100ml tube of vanilla paste – one teaspoon of this paste is equivalent to 1 vanilla pod and unlike vanilla extract you get all of the lovely little seeds too. And at £7.50 this is quite good value when compared to buying individual pods. I used this recently to make Crème Brûlée and was very impressed. I ordered by emailing sales@littlepod.co.uk but you can now order online through greenlife.co.uk. Many of you will be familiar with the fabulous Trish Deseine and may know that Trish recently launched her own range of luxury chocolate Chocolate by Trish, and whilst the chocolate itself is currently only available in Selfridges, London (but hopefully this will change soon) the lovely Atelier set, which includes a very useful recipe book and dainty little moulds to make handmade chocolates, is available to buy online from www.chocolatebytrish.com for €39 incl. P&P to Ireland. One of my favourite shops to visit is Market 57 in Westport, which not only has a great selection of quality, often hard-to-get ingredients but also has the most fantastic cookshop specialising in gadgets, utensils, cookware and bakeware – everything you will need for preparing your feast. The great news is that they now have an online shop www.kitchencookware.ie with nationwide delivery service. This year I have decided to use locally produced Christmas cards and didn’t need to look very far – I found exactly what I was looking for in these cards reproduced from Jane Steger Lewis’ original paper cut artwork. Jane has also created a fabulous range of Love Ireland prints of inspirational words from traditional Irish blessings. Both the cards and prints can be found on I Love Mayo and the beautiful interiors website Garrendenny Lane and would make lovely gifts. Most cooks I know are avid collectors of cookbooks and will be delighted to receive a gift of a new book at Christmas. There is such a brilliant array of Irish cookbooks on the shelves now and the wonderful Donal Skehan of the Good Mood Food Blog is offering personally signed copies of his hugely successful and award winning Good Mood Food cookbook if you hurry. Other recommedations published this year are Catherine Fulvio’s Catherine’s Italian Kitchen and Domini Kemp’s Itsa Cookbook. For the gardening enthusiast who loves the idea of producing homegrown vegetables and fruits for the kitchen I highly recommend Klaus Laitenberger’s Vegetables for the Irish Garden – I bought this for my husband recently and he was delighted to receive a resource specialising in growing in our unique Irish climate. The Wedding CakeIn "Cakes and Baking"
Wow, fantastic post. Love the picture too, very festive. Ah thank you. 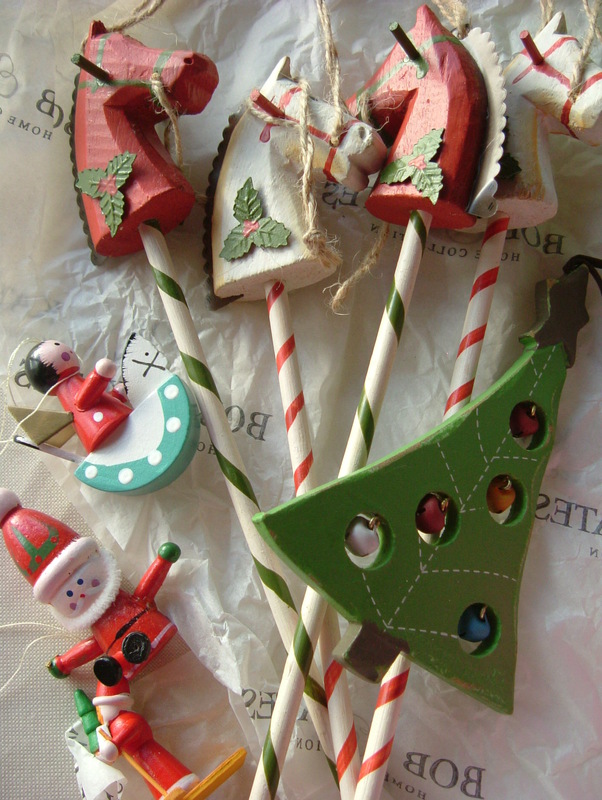 I love those decorations – I bought them in Avoca a few years ago, so old fashioned. Very kind of you m’lady :) Happy browsing! Fantastic info. Thanks for mentioning me! Had no idea that Market 57 had a web site. Off to start browsing!! Hi Jane. You are most welcome – thanks so much for the speed with which you put my order through! Yes fab news about Market 57. Lots of great references to follow up on here. Christmas season has arrived. Enjoy! Thank you. I am delighted we have finally reached December! Hello! Isn’t online shopping brilliant?! Certainly works for me :) Thanks for the comment.